Saulius Baliutavicius is currently working as a customer service manager at MetLife Alico. He is responsible for ensuring delivery of world class service to over 450,000 customers in UAE, Qatar, Oman, Bahrain and Kuwait; consolidating and optimizing B2C and B2B service delivery across all distribution channels, territories, customers and products; improving customer experience through implementation of company level customer centricity and voice of the customer programs, engineering and implementing customer centric processes, establishing new service channels. 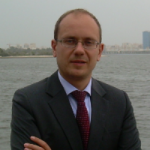 Saulius Baliutavicius has an 11 years’ experience of international customer service, contact centres, customer experience management and consultancy. His professional experience includes working at HR training in Lithuania and neighbour regions as well as customer service managing across many continents and regions. Saulius Baliutavicius holds a Bachelor degree in Psychology from Vilnius University and a Master degree in Psychology from Mykolas Riomeris University, Lithuania.